The soon-to-launch satellite will measure the height and thickness of sea ice, glaciers, ice sheets, and permafrost around the world to an unprecedentedly high precision. How are the heights of sea ice and glaciers changing? How is melting polar ice affecting sea level? How thick is sea ice? How much carbon do the world’s forests store? NASA’s Ice, Cloud, and Land Elevation Satellite-2 (ICESat-2), which may launch as early as Saturday morning, will seek answers to these questions. ICESat-2 will fly about 500 kilometers above Earth and fire laser pulses at the surface, which will then reflect off surface ice and travel back to the satellite. Mission scientists will use the timing of the reflected laser pulses to calculate the height of the surface ice, its thickness, and how these have changed since the satellite’s previous orbit over that spot. The data that will flow from ICESat-2 “are critical to new discoveries, but also are critical to establishing improved predictive models for our Earth’s changing climate,” Lori Magruder, a research scientist at University of Texas at Austin and leader of ICESat-2’s science definition team (SDT), told Eos. ICESat-2 builds upon the scientific success of its two NASA predecessors: ICESat, which operated from 2003 to 2009, and Operation IceBridge, an ongoing airborne mission that began in 2009. Operation IceBridge has been monitoring rapidly changing regions in the Arctic and Antarctica and bridging the gap in polar observations between the end of ICESat and the launch of ICESat-2. ICESat-2 will travel in polar orbits along nearly 1,400 unique trajectories. Combined, each 90-minute orbit will compose a grid of the entire Earth every 3 months before repeating. The rate of laser pulses as the satellite passes overhead corresponds to one measurement every 70 centimeters on the ground, which will produce a finely spaced grid around each pole. The satellite’s 3-month orbit pattern will produce a global grid of ice elevation for each season. 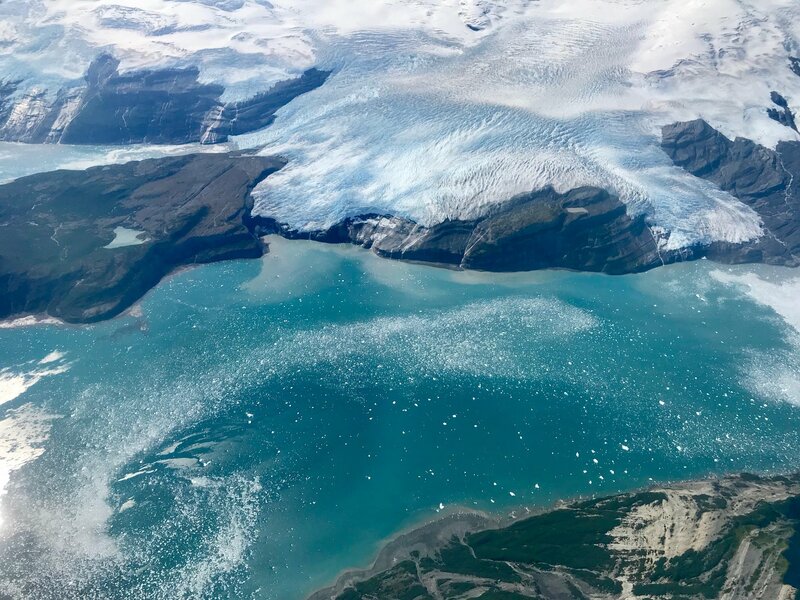 Scientists also plan to use ICESat-2 data to calculate how sea level is affected by melting ice in Greenland and Antarctica, two regions heavily affected by rising temperatures. The satellite’s 3-month orbit pattern will produce a global grid of ice elevation for each season. The satellite will also measure the thickness of sea and land ices and the heights of forests to calculate the amount of carbon sequestered in the vegetation. 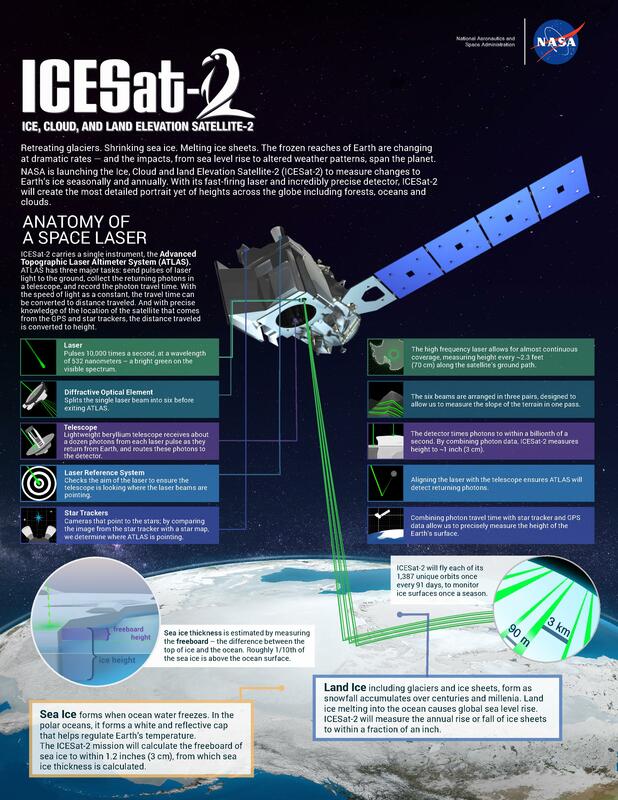 ICESat-2 carries one instrument, a visible light laser transmitter and receiver called the Advanced Topographic Laser Altimeter System (ATLAS). ATLAS transmits the laser pulses toward Earth’s surface and times how long it takes the laser photons to return to the craft after being reflected back. The total light travel time, measured to a precision of 8 ten-thousandths of a nanosecond, reveals how far the light traveled from the spacecraft to the ground and back. “We’re just really firing ping-pong balls down to the surface of the Earth­—these are the photons—and timing how long it is for that ping-pong ball to travel through the atmosphere, all the way to the surface, and then bounce back to the satellite,” Gardner explained. ATLAS produces green laser pulses at a rate of 10,000 per second and splits the light into six separate beams before sending them toward the surface. By splitting the light into six parts, the satellite can measure not only the height of surface ice but also the height of ice nearby. With a little processing, scientists can convert these data into a calculation of the ice’s slope. The video below explains how ICESat-2 receives the reflected photons back at the telescope and calculates the light travel time. The instrument’s receiver filters out all light that’s not the precise wavelength (532 nanometers) that ATLAS originally transmitted, which enables precision measurements. However, the Sun also emits light at that wavelength, so ground-based computers will further analyze the data to remove any detected light that may contaminate the data and affect the height calculations. Once data are processed, the ICESat-2 team predicts that they will be able to calculate the height of ice to a precision of 3 centimeters and calculate annual elevation changes to 4 millimeters. This precision—ATLAS’s ability to resolve heights smaller than the size of an adult’s thumb—is unprecedented, Gardner explained. “It’s just a miracle of engineering that that’s possible from 500 kilometers away from the Earth’s surface,” he said. ICESat-2 is a significant leap forward from the preceding missions, Magruder explained. For example, ICESat had the ability to take one elevation measurement every 70 meters to a precision of 15 centimeters, but ICESat-2 will take 100 measurements across the same distance and be 5 times as precise. And although Operation IceBridge, which will continue through 2019, has continued to measure changes in ice coverage near the poles, the mission lacks the global coverage and frequent measurements that will make ICESat-2 data so scientifically valuable, Magruder explained. ICESat-2 will launch from Vandenberg Air Force Base in California aboard a United Launch Alliance Delta II rocket. The satellite could begin its 3-year mission as early as 5:46 a.m. Pacific Daylight Time on 15 September. Citation: Cartier, K. M. S. (2018), Global ice monitoring satellite to launch as early as this week, Eos, 99, https://doi.org/10.1029/2018EO106015. Published on 13 September 2018.